One of the many things on this trip, that is different than on the last trip, is the demand for power. Instead of shooting everything on one GoPro Hero, I now have two Hero 3+'s - which are significantly more power hungry. I will also have a long a DSLR for use in camp for video and for our final "side by side" shots of the glaciers. Which boils down to one thing. We need power, and it needs to be reliable. I considered many options before settling on the gear that is coming with us. I thought about the Biolite stove, but was concerned that we would find enough tinder - that was dry - and would be able to run it long enough to charge camera batteries. It is also pretty big, and fairly heavy. I thought about the Powerpot, but really this is just converting fuel to power - via a camp stove - and I didn't want to A) bring along that much more fuel, and B) have run a stove all night to recharge a camera. This left me with Solar as my only option, and once that was decided I knew It was going to be a goal zero product. Currently they are the only company offering really innovative products. I quickly realized most of the smaller units wouldn't do what I needed. And so I focused my research on the Sherpa 50. I got one in December and was immediately blown away by how small it was (4.5 x 1.5 x 5.25). 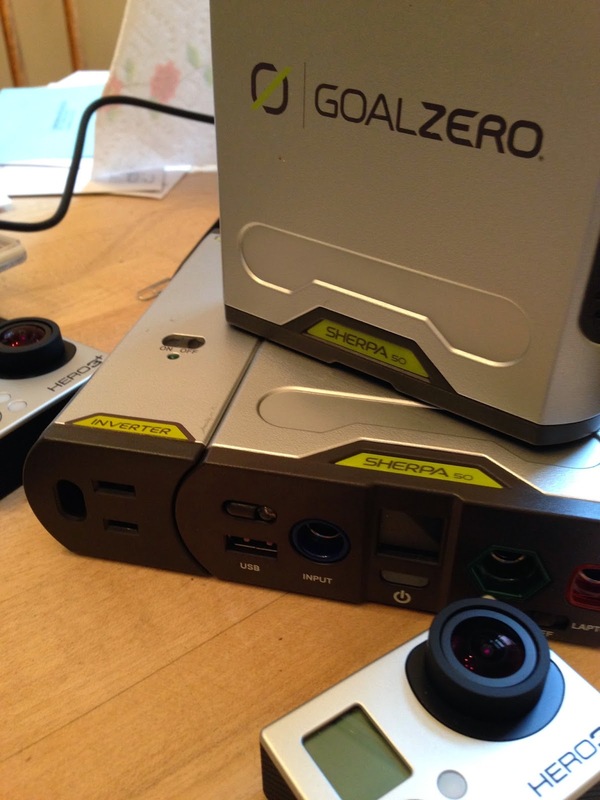 The pictures on GoalZero's site make it look much bigger. It also isn't that heavy (1.2 pounds), but as a paddler that is of less concern for me. It fits easily in my hand and have just recently had time to start working with it. I have been exceptionally surprised with how well this unit has done, particularly considering how I am asking it to work. So the first problem is that I need the unit to charge during the day while we paddle, no problem right? Just put it on the back deck of my kayak. Except, of course the unit isn't waterproof! After racking my brain as to how to make this work - waterproof, and transparent - I realized the idea was literally right under my nose. My Sealine Map case. Waterproof, Flexible and pretty transparent. Of course, I realize that anything between my Nomad 13 and the sun will decrease the panels efficiency, so when I first tested this out, I wasn't too optimistic. I started paddling with the Sherpa 50 charged at 60% on a bright sunny day. I noticed pretty quickly that the map case it was in was covered with water droplets - which I am sure only slowed the rate at which the Sherpa 50 charged. But even so, I was surprised an hour and 20 minutes later to see that it was now charged at 80%. Today, a 2 hour and 20 minute paddle brought me from 80% to Full. The next big question is how many times can a fully charged Sherpa 50 charge a Hero 3+, and that was what I did next. I fully depleted a newer, larger Hero 3+ battery. Then plugged it into the sherpa 50. An hour and 40 minutes later, it was fully charged, about the same amount of time as plugging it into a computer. All in all I am very impressed with the pairing of sherpa 50 and nomad 13 solar panel. We will see how they perform in rainy and cold Alaska. After you charged the fully depleted battery, what percentage was left in the Sherpa 50? What a day yesterday was! Okay we are almost done! Thanks to all our kickstarter backers!